I recently did a polish swap with the very generous and lovely Anita from KONADomania. 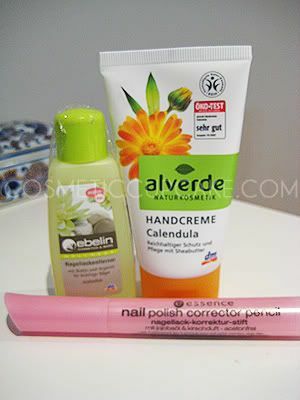 She sent me some great European polishes to try and I sent her some Aussie ones to try in return. I was so excited to receive it in the mail!!!! Just LOOK at all the goodies she included!!! Thank you so much Anita!! 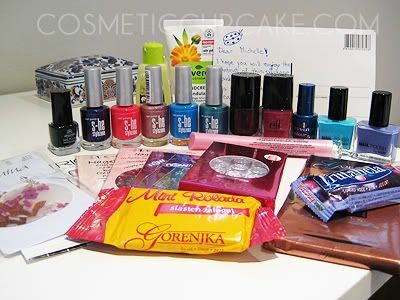 You have really spoiled me with the fantastic polishes and all the extra goodies you included in the package =D Let me share with you the AWESOME items she sent me all the way from Slovenia. S-he polishes in 384, 387, 427, 399 and 426. I love these colours, they're just so bright! Catrice polish in Poison Me, Poison You! - gorgeous purple with shimmer. Elf polish in Berry Pink - very pretty berry colour with shimmer. Alessandro International polish in 263 - dark blue, almost black polish in the cutest bottle! Essence nail polish corrector pencil – this smells so GOOD! And works absolutely fantastic too. I’ve used it on my latest manicures and it’s great! It's 50 times better than the one I've been using from Morning Glory stationary. I’m scared of using it up though, it’s just too good! Not pictured, but Anita also included a very sweet pair of earrings too. My dilemma was which colour to use first! Anita suggested that I use a colour per day which is what I will do! My 1st NOTD using my new polishes is with H & M U Must Have This which is an absolutely gorgeous sky blue creme. I don't have very many blue polishes so I'm ecstatic to add it to my polish collection! Once again thankyou SO much Anita!! Please check our her blog KONADomania! Her konadicures are fantastic and she always creates so many polish lemmings for me. Thanks for looking! And don't forget to enter my 50 followers giveaway! great swap. I have never seen elf Stuff here. I love your mani. The blue is very cute. I will be looking forward to the rest of your reviews since I have been trying to get my hands on some catrice and h&m polishes. wow!! those are great swaps!! @puranki: Definitely pick up the colour! @PetiteLittleGirl: Thanks! Thanks for stopping by btw! @Katie: It's such a gorgeous blue. 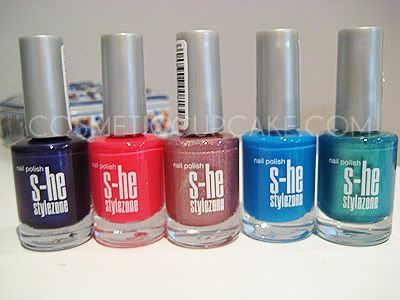 A must have colour if you get the chance to get H&M polishes. where do I buy essence plates?